The Intracoastal Waterway is three thousand mile long waterway that runs along the Atlantic and Gulf coasts of the U.S. Some of the lengths are marked by salt water rivers, natural inlets, bays and sounds, while others have artificial canals. The Intracoastal Waterway offers a navigable route along its length without most of the hazards of open sea travel. For most of the length of the Eastern Seaboard, the Intracoastal Waterway runs from its northern terminus at the Manasquan River in New Jersey. Here it is connected with the Atlantic Ocean at the Manasquan Inlet, and then around the Gulf of Mexico to Brownsville in Texas. At present, the Waterway includes three non-contiguous segments. The first is the Gulf Intracoastal Waterway, which extends from Brownsville, TX, east to Carrabelle in Florida. The second segment begins at Tarpon Springs, FL and extends south to Fort Myers, FL. 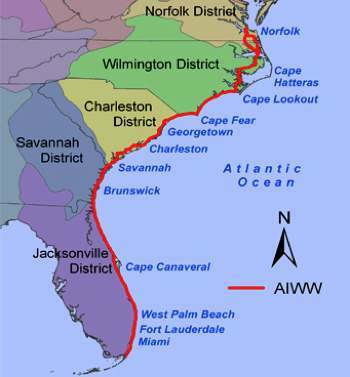 The third segment is the Atlantic Intracoastal Waterway that extends from Key West, FL to Norfolk, Virginia. The Intracoastal Waterway allows for a considerable amount of commercial activity and trade in petroleum and petro-based products, building materials, manufactured products, and foodstuff. Recreational boaters also make extensive use of the waterway. Some of the traffic in fall and spring on the east coast is by snowbirds that move south in winter and north in summer. When the ocean is too rough for travel, the Waterway is used for the commercial traffic. The Intracoastal Waterway connects a number of navigable rivers, where ships can travel to inland ports, including Alabama, Mississippi, Savannah, Delaware, James, Hudson, and Connecticut Rivers. Aids to navigation are provided with colors, numbers, marks and lights that follow the same navigation system as all other waterways. Some portions of the Waterway are marked in yellow, but the numbering and colors of buoys, day marks and lights maintain the standard system as observed in most waterways. Any quartermaster will have a good time with this but of course GPS makes navigation a lot easier, certainly at night.